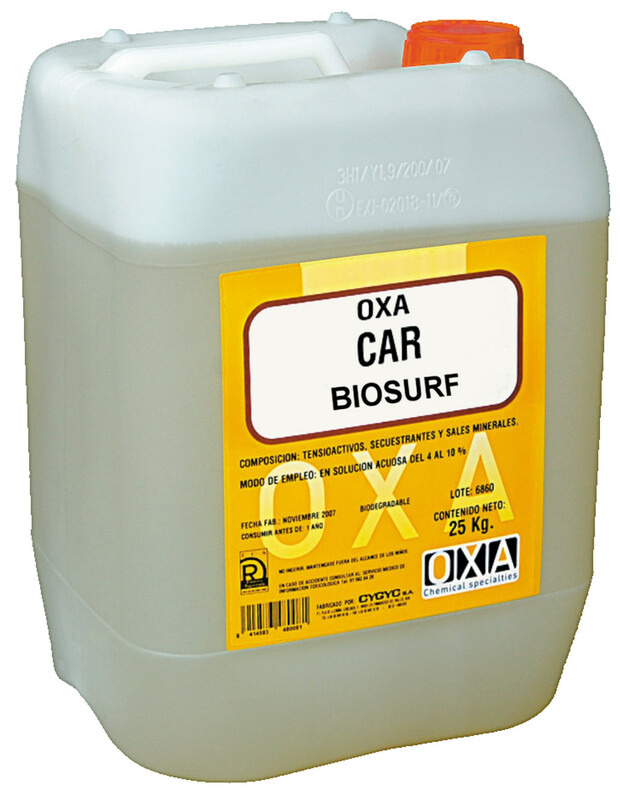 OXA - CAR BioSurf is an effective product against oil stains produced by cars, trucks and machinery in general on hard surfaces. Its exclusive formula has a dual surfactant and biological action on hydrocarbons and solvents, which allows deep cleaning respectful with the environment. The product contains powerful surfactants and selected strains of Bacillus spores and Paenibacillus, highly effective in the degradation of hydrocarbons; gasoline, diesel oil, lubricating oils and solvents; such as benzene, toluene, ethylbenzene, o, m, p-xylene, phenol, cresol, naphthalene, phenanthrene and biphenyl. Concentrated liquid detergent for pre-wash and exterior vehicle parts wash.